This is a guest post by Steven Koprince of SmallGovCon. Please note that this blog post was originally published on December 5, 2016, before the Act was signed by the President on December 23, 2016. The 2017 National Defense Authorization Act will essentially prevent the VA from developing its own regulations to determine whether a company is a veteran-owned small business. Yes, you heard me right. If the President signs the current version of the 2017 NDAA into law, the VA will be prohibited from issuing regulations regarding the ownership, control, and size status of an SDVOSB or VOSB–which are, of course, the key components of SDVOSB and VOSB status. Instead, the VA will be required to use regulations developed by the SBA, which will apply to both federal SDVOSB programs: the SBA’s self-certification program and the VA’s verification program. In my experience, the typical SDVOSB believes that VA verification applies government-wide, and relies on that VetBiz “seal” as proof of SDVOSB eligibility for all agencies’ SDVOSB procurements. But contrary to this common misconception, there are two separate and distinct SDVOSB programs. The SBA’s self-certification program (which is the “original” SDVOSB set-aside program) is authorized by the Small Business Act, which is codified in Title 15 of the U.S. Code and implemented by the SBA in its regulations in Title 13 of the Code of Federal Regulations. The VA’s separate program is codified in Title 38 of the U.S. Code and implemented by the VA in its regulations in Title 38 of the Code of Federal Regulations. There are some important differences between the two programs. For example, the VA requires that the service-disabled veteran holding the highest officer position manage the company on a full-time basis; the SBA’s regulations do not. Following a 2013 Court of Federal Claims decision, the VA allows certain restrictions of a veteran’s ability to transfer his or her ownership, but that decision doesn’t necessarily apply to the SBA, which has held that “unconditional means unconditional,” as applied to transfer restrictions. And of course, the VA’s regulations require formal verification; the SBA’s call for self-certification. Despite these important differences, the two programs are largely similar in terms of their requirements. However, last year, the VA proposed a major overhaul to its SDVOSB and VOSB regulations. The VA’s proposed changes would, among other things, allow non-veteran minority owners to exercise “veto” power over certain extraordinary corporate decisions, like the decision to dissolve the company. The SBA has not proposed corresponding changes. In other words, were the VA to finalize its proposed regulations, the substantive differences between the two SDVOSB programs would significantly increase, likely leading to many more cases in which VA-verified SDVOSBs were found ineligible for non-VA contracts. That brings us back to the 2017 NDAA. Instead of allowing the VA and SBA to separately define who is (and is not) an SDVOSB, the 2017 NDAA establishes a consolidated definition, which will be set forth in the Small Business Act, not the VA’s governing statutes. (The new statutory definition itself contains some important changes, which I will be blogging about separately). So there you have it: the 2017 NDAA consolidates the statutory definitions of veteran-owned companies, and calls for the SBA–not the VA–to issue regulations implementing the statutory definition. The 2017 NDAA requires the VA to use the SBA’s regulations, and expressly prohibits the VA from adopting regulations governing the ownership and control of SDVOSBs. These prohibitions, presumably, will ultimately wipe out the two regulations with which many SDVOSBs and VOSBs are very familiar–38 C.F.R. 74.3 (the VA’s ownership regulation) and 38 C.F.R. 74.4 (the VA’s control regulation). Because both agencies will be using the SBA’s rules, the SBA Office of Hearings and Appeals will have authority to hear appeals from any small business denied verification by the VA. This is an important development: under current VA rules and practice, there is no option to appeal to an impartial administrative forum like OHA. Intriguingly, the 2017 NDAA also mentions that OHA will have jurisdiction “[i]f an interested party challenges the inclusion in the database” of an SDVOSB or VOSB. It’s not clear whether this authority will be limited to appeals of SDVOSB protests filed in connection with specific procurements, or whether competitors will be granted a broader right to protest the mere verification of a veteran-owned company. So when will these major changes occur? Not immediately. The 2017 NDAA states that these rules will take effect “on the date on which the Administrator of the Small Business Administration and the Secretary of Veterans Affairs jointly issue regulations implementing such sections.” But Congress hasn’t left the effective date entirely open-ended. The 2017 NDAA provides that the SBA and VA “shall issue guidance” pertaining to these matters within 180 days of the enactment of the 2017 NDAA. From there, public comment will be accepted and final rules eventually announced. Given the speed at which things like these ordinarily play out, my best guess is that these changes will take effect sometime in 2018, or perhaps even the following year. The House approved the 2017 NDAA on December 2. It now goes to the Senate, which is also expected to approve the measure, then send it to the President. In a matter of weeks, the 180-day clock for the joint SBA and VA proposal may start ticking–and the curtain may start to close on the VA’s authority to determine who owns or controls a veteran-owned company. 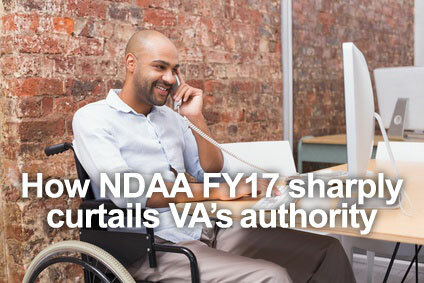 This post originally appeared on the SmallGovCon blog http://smallgovcon.com/service-disabled-veteran-owned-small-businesses/sdvosb-programs-2017-ndaa-sharply-curtails-vas-authority/ and was reprinted with permission.